After building my first computer some moons ago, I soon became interested in ergonomically designed keyboards. Perhaps the fact that they were different from normal keyboards was what drew me to them initially. These differences led me to ponder-why would anyone want a keyboard that is shaped differently than a normal keyboard? That led to me learning about RSI and ergonomics. I started off purchasing a cheaper logictech keyboard that I found at Software and Stuff for use at work. Surely if I was going to make my living typing code I should invest in my equipment to protect myself. Besides, how would I throw a frisbee and play ultimate if I had carpal tunnels? Time passed and I picked up a used MS ergonomic keyboard. It seemed pretty good other than the arrow keys were arranged in a cross pattern. (Why change that yet leave everything else in the same position? It boggles the mind). I seemed satisfied and life went on. Eventually I picked up an MS 4000. It was available and the local office store and felt decent enough when trying it out in the store. It worked fine (or seemed to). Until I started looking into keyboards more. I learned about switches. Each key has its own switch that activates it. The best switches were mechanical buckling key switches. They had a distinct tactile “click” when the press of the finger activated the key. This was supposed to provide for more ergonomic typing because your finger didn’t try to crush the key, but rather could feel when it was activated. They also made a cool sound. And if you typed fast enough it was like having a little machine gun. (The sound also corresponded to the mechanical activation, so you could base your finger movements on that as well). Another great feature about BS keyboards was that they seemed to last forever. As I looked into them many people had IBM Model M keyboards from the 80’s that were still going strong. I had already destroyed the switches on one keyboard and had just figured that keyboards were disposable. (Which was a sad thought because it seemed like every “ergonomic” keyboard at the time had limited runs, so you never knew what your next keyboard would be). Hmmm, but there weren’t any buckling spring keyboards in ergonomic designs. Wrong! IBM actually produced an ergonomic version, the M15, for a short time in the 90’s. The only problem was they didn’t sell well and they stopped producing them. Of course since they were BS switches they should still be around. Ebay to the rescue. 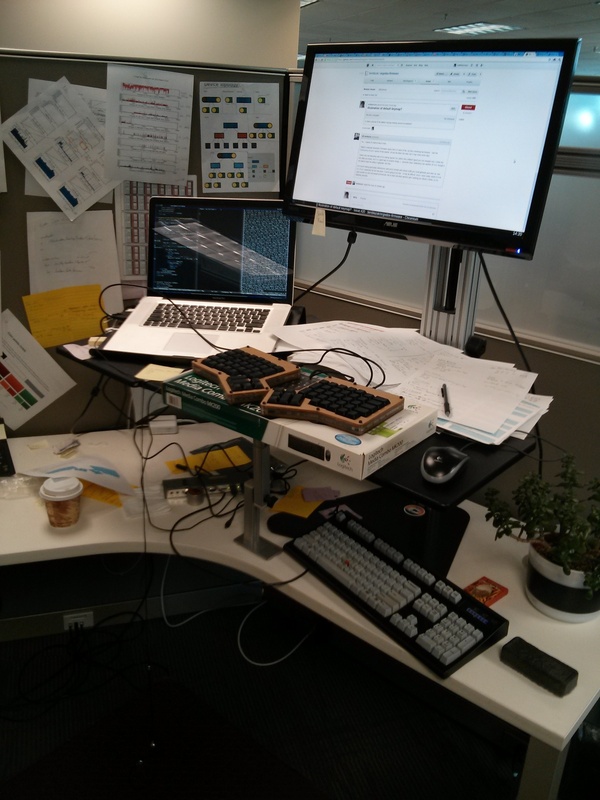 Sadly it appeared that every other ergo keyboard geek had the same idea as me. The price for these rare keyboards if they ever do reach Ebay is pushing $1500! (There just happens to be one on ebay right now with a buy-it-now price of $1249, that’s a steal!) I love my fingers and wrists but apparently not that much. But BS springs intrigued me. Plus I was using ThinkPads as my main workhouse and came to appreciate the track point in the middle of the keyboard. I could mouse around without taking my fingers off of the home row. It just so happened that the company that bought IBM’s BS equipment and processes, Unicomp, also continued to make a BS keyboard with a trackpoint. Another key event of that time was that a key on my MS 4000 also went out. And after reading about BS switches I became very sensitive to typing on my “ergonomic” keyboard. (Finding out about BS switches was like reading “The Elements of Typographic Style”, once you know about kerning and ligatures you look for them everywhere. It’s hard to unlearn that factoid). I became very apparent that hitting the wider keys on the left edge with my pinky was a great pain. I believe this was because the keys are so wide that the keycaps are rubbing against the mechanism during depression causing binding and lockup. Due to that I would press them even harder, which is bad, and even worse for pinky fingers. I figured if the current ergo designs have crappy keys, maybe BS switches are good enough and picked up a Unicomp Endura Pro. I was pretty happy with that keyboard. (My only gripe is that the buttons for the trackpoint aren’t BS and so they become worse over time or even stop working). But I loved the switch mechanism. It was probably half in my mind (Stockholm Syndrome) and half due to the crappiness of the switches on the MS 4000. If I ever had a keyboard that was in an ergonomic shape it would have to have high quality switches. In the subsequent years I read about Kinesis, Maltron, and eventually Truly Ergonomic brands of keyboards. These companies were the only companies offering “ergonomic” designs in keyboards with mechanical switches. (None had BS switches, but they used Cherry brand switches, which many like because Cherry’s don’t just come in one style like BS switches-loud and tactile. Cherry’s have different switches that fill in a matrix with different values for activation force, tactility (or lack thereof), and loud (or not). Cherry Blue’s are supposed to be the equivalent of BS switches (or similar enough). The mechanical mechanism on these switches should be smooth and last for years, instead of months. An interesting feature that I loved about these nicer ergonomic keyboards was that they used a “matrix” layout. If you look at any modern keyboard you will note that it slants up and to the left. If you think about that, it doesn’t make sense that both hands go up and to the left. Shouldn’t one hand do that and the other hand go in the opposite direction? And I haven’t even gotten to actual layout of the keys. Both of these “features” are hold-overs from days gone past of typewriters, where layout was designed to limit typing speed as to not jam the mechanism. In a modern age, where we have ergonomics yet also want to type fast shouldn’t we drop the legacy features of days past completely? Apparently not. Most keyboards still adopt the slanted layout. But the ergonomic keyboards I mentioned do not. Conforming to century old norms for keyboard layout has led to a lack of innovation in keyboards. But all of these ergonomic keyboards had a glaring problem. They were “ergonomic” but hard coded the ergonomics! Similar to using a “magic number” in programming, they had physical plastic cases that forced (or assumed) the typist to conform to their ideal of button positioning and distance between hands. That seemed restrictive and silly. There were actually split keyboards that existed. Each hand was separate, but they all had crappy rubber dome switches and/or non-matrix layout! 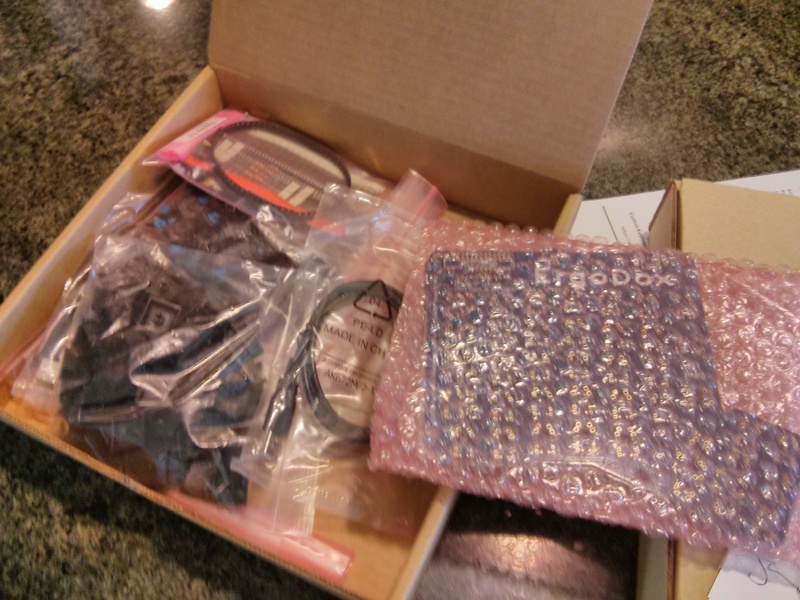 I ended up surfing across a forum for keyboard enthusiasts, http://geekhack.org/. One day in the ergonomic keyboard subsection there was a post. This was in October 2011. The post had renderings of a cool looking programmable, split, matrix style keyboard that would cost around $400. Pricy, but it had most of the features I wanted. Fast forward a year and a half later. 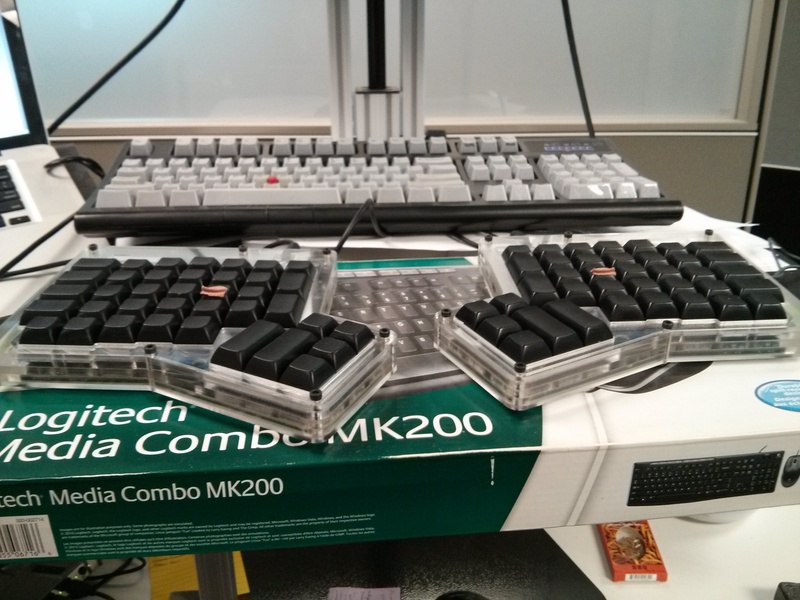 After hacking/compromise of geekhack, (continued discussion continued on http://deskthority.com/), lack of community members interested in organizing a group buy, and http://massdrop.com/ stepping in to organize a group buy, I finally had a kit to build a keyboard. Fast forward a long night after than and I had my keyboard. 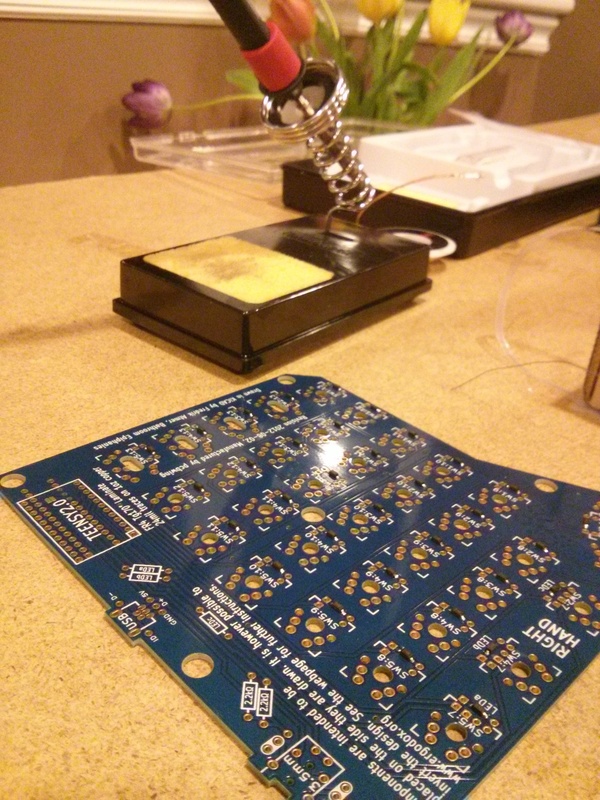 It cost $240 and took about six hours to assemble (having never really soldered before myself). Mechanical switches I purchased Cherry Blue switches which are both tactile and non-quiet to emulate my buckling spring switches (my co-workers have yet to complain about my BS switches). They are rated at 50 million presses, which should outlast me. Having broken a couple rubber dome switches this was important. Also I appreciate that they are smooth and consistent, which has not been my experience with rubber dome switches. Once you go mechanical rubber dome keyboards feel chintzy. (The Lenovo and Apple laptop keyboards are pretty decent though). Ergonomic A tenet of most ergo designs is that your hands are allowed to come to a natural position, rather than forced to fit into the confines of a keyboard based on a century old typing device. Check. Columnar Layout Rather than a normal staggered layout like most keyboards, the ErgoDox has a columnar layout. Your fingers on both hands don’t naturally point up and to the left, and your keyboard shouldn’t either. (This might take some getting used to. Some columnar layouts put the number 2 above “Q” rather than one because your muscle memory seems to hit that better. I’ve just tweaked the configuration of my layout to try that scheme). Here's my current configuration. Split Halves This was a biggie to me. Again, the Maltron, Kinesis, and TrulyErgonomic all look like they are decent keyboards, yet they hard-code the distance between the hands. With split halves I have 3 degrees of freedom for each half and can create infinite combinations. As the standing desk vs sitting all day debate is raging, I think there is a middle ground. Common sense seems to indicate that variety is probably better than either end of this dichotomy. You should probaly stand, walk, and sit during the day. Wouldn’t it be nice if you could position your hands close together for a time, and then spread them out further apart? Most keyboards don’t allow that. I’ll probably get some sculpy (maybe 3d printing) and experiment with stands for tenting and other angles of the keyboard. (The similar to the stand accessory for the Kinesis Freestyle2). Thumb Keys Humans have opposable thumbs. Yet most people only use one thumb to type on one key. That seems to be a huge waste. Many of the more modern keyboards (Maltron, Kinesis, and TrulyErgonomic) have keys for the thumbs. This is probably the root of the cause for a steeper learning curve for these keyboards. Because many of the keys are moved under the thumb (and away from the fingers that normally depress them) it can make typing a chore until muscle memory is built. But I believe there should be big dividends after that time. Programmable The folks at Massdrop created a nice little web application to create layouts for the keyboard. One cool feature is that these layouts can be “stacked”. You could create a layout for qwerty, dvorak, and colemak. You can let the keys under the thumbs be optimized to your desires. I’m still messing around with key configuration as I’m getting used to the keyboard. Open Source This applies to software and hardware. The firmware is on GitHub. The designs are in the open. Even though it took a commercial company to step up and organize the group buy, one could produce their own keyboard using the existing plans. Because I physically built this keyboard, I feel like I have some semblance of understanding of what is going on at the hardware level and could “fix” a problem with a switch or short should it arise (say a drink was spilled into the keyboard). I’m not sure that is the case with most keyboards out there today. Yes, it is the most expensive keyboard I’ve ever purchased. But it is cheaper than both Maltron and Kinesis and costs about the same as the Truly Ergonomic. But I feel it is a better keyboard than all of those. I also flip that cost issue around and say it is an investment in tooling that should pay dividends. Also if the ergonomic benefits hold out, it is an investment in my body. Surely my wrists and hands are worth $240, which is about half of the cost of the original estimate. Right now I’ve only used the keyboard for one full day at work. I’m tracking the commands I do in emacs. After a couple days of recording the commands I’ll examine what I’m doing and see if it makes sense to create a layer with emacs specific chords. I’m more cognizant of my finger movements, both when they migrate off the home row and with my thumbs. I’m trying to figure out what optimizations I could make to my layout. Since all the keys were the same, I threw on some bandaids the indicate hand position (yep need to order two more keycaps). I’ll be honest. It is harder to type on right now. One thought I’m having is geeking all out. Considering that many musicians can play a guitar and a bass guitar differently, I’m wondering if I should treat this keyboard as a new “instrument”. Rather than slightly tweaking the normal “QWERTY” layout, perhaps I should try MALT or Colemak. Considering that when I’m using the thumb keys it does feel like a different instrument perhaps it would be easier to make the mental switch between normal keyboards and my geeked out keyboard. Another nicety is that the keyboard itself contains the mappings. So if I use the ErgoDox on another machine I’ll get my mappings. Which is not the case if I’m using DVORAK on my normal laptop, but then switch to my wife’s where she’s using the standard QWERTY layout. Thoughts on this? I realize many just do not care. A keyboard is a keyboard is a keyboard. For those I’m sorry you suffered through this post. For the rest, realize the the keyboard is currently the biggest interface we have with computers. If we can interact more efficiently and ergonomically isn’t that a noble effort? Full Disclosure. I have no affiliation with Massdrop (other than they are located near my Alma mater). They delivered me a great product. They are planning on doing another run of these soon. If you are interested follow them, or follow me on twitter. I’ll probably tweet about any new group buys they do.